Pillar to Post: MEDIA MONDAY / IS THE DEMOCRACY IN CRISIS? The first two months of the new administration have been plagued by widespread protests, leaks, acrimony with the press, and legal challenges, fueling a flood of think pieces calling this a “constitutional crisis,” comparing President Donald Trump’s brand of populism to that of dictators around the world, and auguring that this version of white ethno-nationalist populism may signal the end of American democracy as we know it. Yet while we are certainly seeing tensions between the branches of government, as well as alarming changes in the tenor of our politics, it seems unlikely this rising populism will damage our governance forever. Why? Because this debate is literally thousands of years old—political commentators from ancient Greece and Rome were ever wary that what they viewed as too much democracy might lead to rule by a demagogue or to anarchy. And while neither Aristotle nor Polybius can address, specifically, the stressors in our democracy today, their ancient analysis of the ways governments grow and change can give us insight into our own time—and what we need to do better. Both Aristotle and Polybius identify three virtuous forms of government—monarchy, aristocracy, and democracy—and their three “perverted” forms—dictatorship, oligarchy, and mob rule – and lay out the ways that each form arises and cycles through the others (Aristotle Politics 3.7, Polybius Histories 6.6-6.9). Both see the cycle of government beginning with a just monarchy, falling into dictatorship, morphing into a virtuous aristocracy, which decays into an oligarchy, before the people rise up and establish a constitutional government—or democracy—which in turn is perverted. Here, Aristotle and Polybius differ. Aristotle sees democracies declining into rule by the masses over the rule of law (Politics 4.4), while Polybius claims that “this is the regular cycle of constitutional revolutions, and the natural order in which constitutions change, are transformed, and return again to their original state (6.9). Both, however, see democracy as a stop on the road before it slides into a perversion of itself. 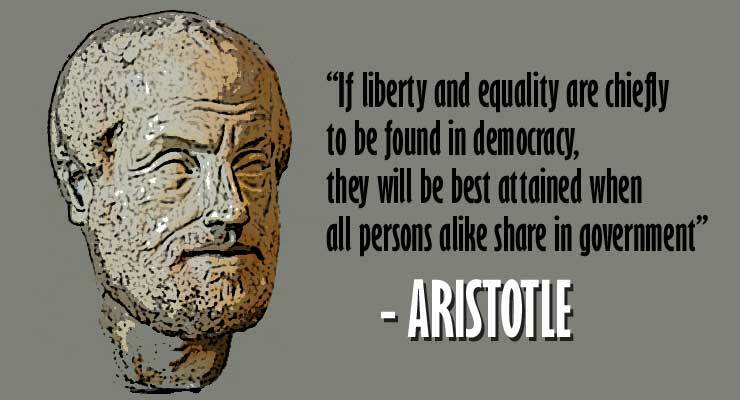 Aristotle’s solution to the inevitable perversion of each form of government was, at its most basic, an appeal to education. He claimed “that which most contributes to the permanence of constitutions is the adaptation of education to the form of government.” (Politics 5.9), such that if a government is democratic, the people should be educated democratically, and taught early the spirits, norms, and assumptions that undergird that form of government. Polybius, on the other hand, found the solution in mixed government—a form of constitutional arrangement that “combined together all the excellences and distinctive features” of monarchy, aristocracy, and democracy. He believed that by mixing the best parts of a central single ruler with the powers of a strong few and the mitigating influence of popular rule, “no part should become unduly predominant, [nor] be perverted into its kindred vice; and that … no one part should … decisively out-balance the others; but that, by being … in exact equilibrium, the whole might remain long steady.” (Polybius Histories 6.10). And both worried that “many practices which appear to be democratic are the ruin of democracies” (Aristotle Politics 5.9). America’s Founding Fathers also worried about the over-democratization of political processes. In Federalist 10, for instance, James Madison wrote that “democracies have ever been spectacles of turbulence and contention; have ever been found incompatible with personal security or the rights of property; and have in general been as short in their lives as they have been violent in their deaths … A republic, by which I mean a government in which the scheme of representation takes place, opens a different prospect, and promises the cure for which we are seeking.” He and his co-authors found clear value in intermediate layers between the people and their exercise of power. Why? To keep the nation from sliding too far toward pure democratic rule, which they worried could lead to a tyranny of a majority over disagreeing factions. We can see the evidence of some of their worries in today’s political debates. We have entered an age of unprecedented democratization of communication and connection. Technologies like Twitter and Facebook have changed the way a president communicates with the people who elect him or her, sidelining the role of an independent media. Trump himself has said that he doesn’t need traditional media, instead turning to Twitter to reach the people directly through pithy one-liners, speculation, insults, video statements, and more. With such a direct connection between the president and the people, we lose the important intermediate steps of fact-checking, analysis, and commentary that are important in ensuring a well-informed populace, and find ourselves instead in the realm of “alternative facts”—Aristotle would have been aghast at how far from a civic and democratic education we’ve come! Here, trust in an independent, and fact-based media is key to combating the proliferation of incomplete information put out in a 140-character tweet. Polybius, meanwhile, would probably be unsurprised by the rise in hate speech incidents following Trump’s election. He wrote that when a demagogue takes power in a democracy, “as soon as [the mob] has got a leader sufficient and daring … [it] produces a reign of mere violence” (Histories 6.9)—and the direct, daring communications of our current president can be wielded against (especially) minority groups in ways that lead to violence. We can also use Aristotle and Polybius’ lens to examine how we might address the over-democratization of the political process. For one, civic education would reestablish baseline norms to animate all political discussions. Increased understanding of the differences between legislation and executive orders, the powers apportioned to Congress as opposed to the president, and the role of the judiciary could fuel real discussion about the appropriate reach and power of the president’s executive orders, for instance, and their likely effects. Moreover, the compilation of best practices based on fact and experience might bring some of the intense polarization in Congress to a halt. Equally, Polybius speaks to obedience and to fair and just laws as a necessary condition for a just democracy (Histories, 6.47). Today, the role of a fair and independent judiciary is paramount to maintaining limits on the power of the president, as demonstrated in last month’s Ninth Circuit decision to strike down Trump’s first travel ban, and the Hawai’i court’s restraining order against the second ban last week. Our Founding Fathers conceived that “controversies between the nation and its members or citizens, can only be properly referred to the national tribunals” (Federalist 80)—and while the Supreme Court only built a case for judicial review of executive and legislative action in the landmark Madison v. Marbury case of 1803, we see the courts play an important role in making sure there are barriers between the will of the people and the person they elected, and their exercise of power. Yet more important still, we can look to Aristotle and Polybius to remind us how unlikely it is that the Trump presidency will be the end of democratic governance as we know it. Philosophers have been debating the fall of great civilizations for thousands of years. We can turn to ancient analysis on how to strengthen our democracy because we’ve been here before (and will, regrettably, likely be here again). With active support for civic education, an independent media, a strong judiciary, and adherence to Republican principles of representation rather than direct rule, our institutions are very likely to survive this presidency—despite fears to the contrary.